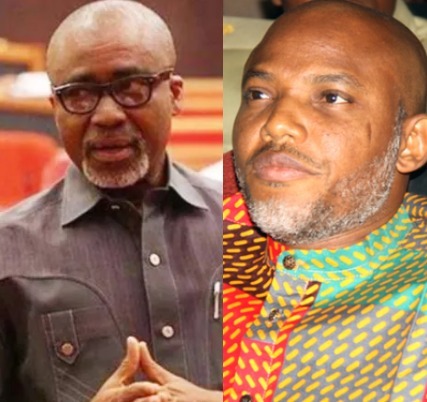 A Federal High Court sitting in Abuja, Nigeria’s capital, has ordered the three persons, including Senator Eyinnaya Abaribe, who stood sureties for Nnamdi Kanu, to pay the sum of N100m each into the court’s account for their inability to produce the missing secessionist leader in court. The Presiding judge, Justice Binta Nyako gave the order on Wednesday in a ruling in which she amended the conditions of the bail she granted to Kanu in April 2017. CKN News reports that Kanu, who is the leader of the proscribed Indigenous People of Biafra (IPOB) and director of radio Biafra, is being prosecuted before the court on charges of treasonable felony. The trial of the IPOB leader had been earlier separated from that of his co-accused following his disappearance after a military invasion of his home in Afara-Ukwu, Umuahia, in Abia State September 14, 2017. Last year, the three sureties who guaranteed Kanu’s bail were made to sign a bail bond of N100m each which was backed by their landed assets whose documents were deposited in court. However, at the resumption of proceedings today, an amendment was ordered by the court, with the sureties now required to deposit cash of N100m in the bank account of the court. In her ruling, Justice Nyako held that the three sureties had two months to pay the sum of N100m each into the court’s account. Justice Nyako reiterated that the order directing the sureties to pay the money was an order of interim forfeiture. The presiding judge fixed March 28 for the hearing of the motions filed by the sureties to challenging the duties imposed on them to produce the IPOB leader. Concise News reports that the ruling is coming one week after Abaribe, a senator representing Abia South, wrote the Nigerian High Commissioner to Israel, Enoch Duchi, to confirm if the IPOB leader is in Israel. Kanu, who resurfaced in Jerusalem, Israel October 19, is leading a group seeking secession from Nigeria. The group has since been proscribed by the Nigerian Government.